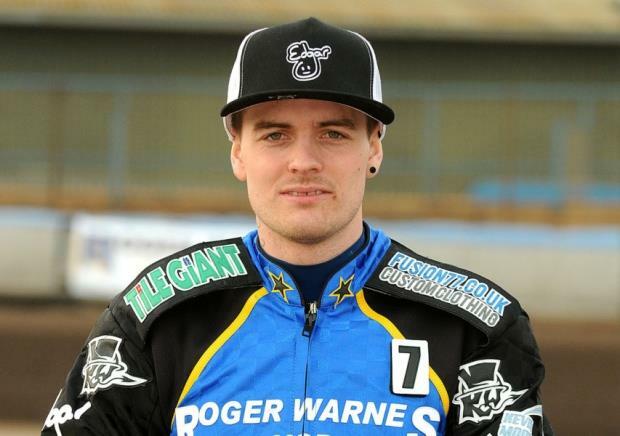 Injured speedway racer Lewis Kerr has woken from an induced coma after being involved in a terrifying crash at Peterborough on Sunday. The accident was so severe it forced racing to be abandoned, partially because the 25-year-old's fellow riders were too shocked to continue. Kerr's pregnant wife Jessie used his Twitter account on Thursday morning to tell his concerned followers that he had been brought round from the induced coma, was able to breath for himself and had said the name of their unborn child. He was hurt while racing for his Premier League club Newcastle Diamonds in a national level race and was airlifted to Addenbrookes Hospital near Cambridge. After coming together with another rider Kerr crashed through the air fence at high speed. The news on the Norfolk racer comes as a fighting fund to help his family has surged past the £8000 mark, well over the original target. 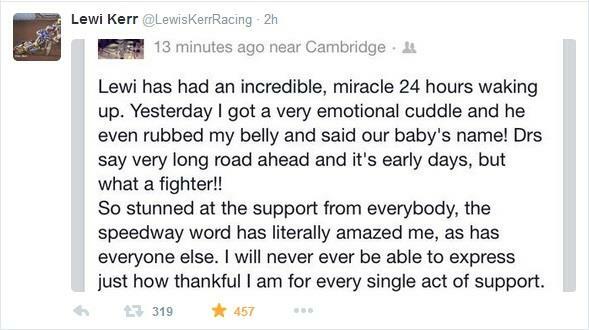 Speedway fan Caroline Love started the GoFundMe campaign on Monday to raise money to help support the stricken racer’s family. It sailed past the initial target and she has since had to keep increasing the target to cope with the amount of donations. Money has poured in from speedway supporters across the country and Kerr’s fellow riders, including his King’s Lynn team-mate Niels-Kristian Iversen, who won last month’s British Grand Prix in front of over 40,000 fans in Cardiff.